Simon has a Bachelor of Science and is a specialist for IT security and cryptography. While working as a trainee at Fraunhofer Institute for Applied Information Technology FIT in Cologne, he consulted on blockchain technology and was co-author for several publications on the topic of conception and implementation of smart contracts based on blockchain technology. 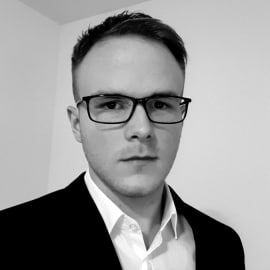 With now more than 7 years of experience as a software engineer Simon is CTO and Head of Blockchain development at RYSKEX GmbH, responsible for both  architecture and practical implementation of secure and extensible smart contract solutions and contact person for various corporate in question of blockchain, smart contracts and influencing.